While these conversations are important, it is also time to start expanding the conversation. It’s hard to believe, but the oldest millennials are actually turning 38 this year; they’re no longer the fresh-faced youngsters that many people continue to picture when they hear the “m” word. Taking their place as the new kids on the block are Gen Z, who are joining a workforce where not just the millennials, but Gen Xer and Baby Boomers are still going strong, with an assist from many Traditionalists still working today. To explore this phenomenon and provide advice on how to thrive within it, I recently turned in the manuscript for my next book, “The Remix: How to Lead and Succeed in the Multigenerational Workplace,” to be published by HarperCollins in May 2019. Similar to my earlier post, “What is a Millennial?” here is everything you need to know about today’s multigenerational workplace. What are the different generations in the “multigenerational workplace”? Generation Z: Born since 1997; end date and total number of births not yet determined. For more on the general characteristics of each generation, here is a definitive guide to generations in the workplace. Why is this such a pivotal moment in the workplace? Consider the chart below, from the Pew Research Center, which shows how the workplace has evolved from a three-generation mix when I first started my career in the late 1990s, to the unprecedented five-generation mix that exists today. Today, you never know what generations will be represented in any room you step into—every meeting with clients, new customers or colleagues; every networking event; every recruiting or interview conversation—could include people up to six decades apart in age and work experience. One telling statistic is that more than 40 percent of Americans today work for a boss who is younger than they are. That is a turning point in the workplace, which used to be extremely hierarchical, based on age. Now the most experienced or senior person is not necessarily the oldest person in the room. Some see this mixing as a challenge—how is it possible to accommodate such diverse perspectives? 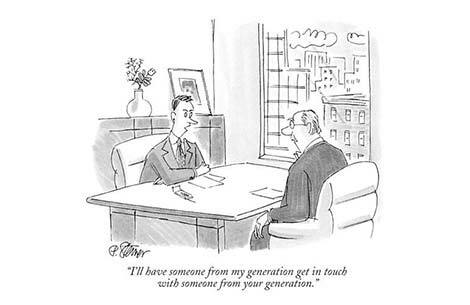 Instead, I recommend regarding today’s generational mix as a competitive advantage that companies should leverage. Why? Because this diverse workforce represents the diverse market in which we operate. If you’re a marketer and want to sell something to someone, you have to speak their language. And how better to navigate that than by having an employee base that reflects those to whom you want to sell your products and services? Plus, having more diverse perspectives has been consistently proven to drive overall innovation and business results. These generational differences are naturally going to breed some tension. How can companies address that? While the multigenerational mix offers tremendous opportunities, that doesn’t mean it can’t be challenging to navigate sometimes. There are three main ways companies can ease the friction that can result from a multigenerational workforce. Learn about the experiences of other generations to better understand their values, priorities and preferences. Have a cup of coffee with a member of a generation that is different from yours and see what you learn about each other. Avoid a zero-sum mentality. Members of all generations should adapt and embrace what is best for your customers/clients or the organization. In The Remix, I use the analogy of a remixed song to advocate for combining the best of each generation’s practices–the classic and the new–to create a more successful and inclusive workplace for all. Remember that, as Voltaire said, “Common sense is not so common” and we are more alike than different. I don’t believe anyone walks into their place of work saying, “Who can I most annoy today?” We are all trying to do the best we can. Finally, remember that even when talking in terms of generations, people are still individuals. Generations are just one lens we can use to find clues to people’s preferences and behaviors. It is crucial to remember that this is just one part of someone’s identity. We are all individuals, and being born in a certain age demographic does not guarantee anything. As an optimist, I see individual difference and generational difference as tremendous positives. Think of the millennial and Baby Boomer, or Gen Z and Gen X, sitting across the table from one another as peers, each sharing their ideas and knowledge, mentoring each other, with conversation and ideas flowing in all directions, and every individual benefitting from that exchange of perspectives. What has been your experience in the multigenerational mix?